2.4 What determines bread quality? 13.5 How much dough rheology can we explain? 21.5 How can bread aroma be improved? 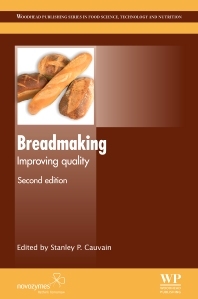 The first edition of Breadmaking: Improving quality quickly established itself as an essential purchase for baking professionals and researchers in this area. With comprehensively updated and revised coverage, including six new chapters, the second edition helps readers to understand the latest developments in bread making science and practice. The book opens with two introductory chapters providing an overview of the breadmaking process. Part one focuses on the impacts of wheat and flour quality on bread, covering topics such as wheat chemistry, wheat starch structure, grain quality assessment, milling and wheat breeding. Part two covers dough development and bread ingredients, with chapters on dough aeration and rheology, the use of redox agents and enzymes in breadmaking and water control, among other topics. In part three, the focus shifts to bread sensory quality, shelf life and safety. Topics covered include bread aroma, staling and contamination. Finally, part four looks at particular bread products such as high fibre breads, those made from partially baked and frozen dough and those made from non-wheat flours. With its distinguished editor and international team of contributors, the second edition of Breadmaking: Improving quality is a standard reference for researchers and professionals in the bread industry and all those involved in academic research on breadmaking science and practice.